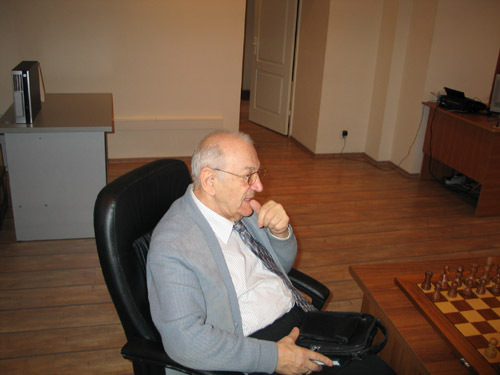 А.Kentler. Break-through to the future. A.KENTLER. GARRY-GARRY! IS IT CLEAR? 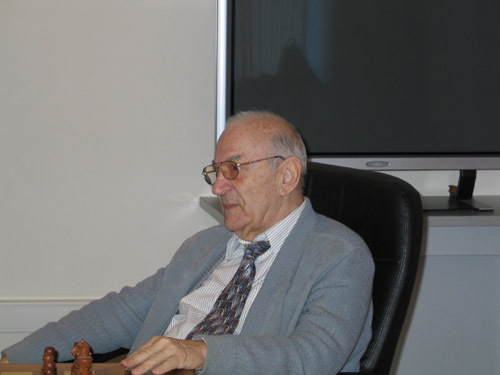 It’s always interesting to listen to Viktor Lvovich Korchnoi. It’s something like watching a blockbuster – you’ll never guess the development of the action. Our moviemakers are making the first steps in this genre: “Night watch”, “Day watch”. 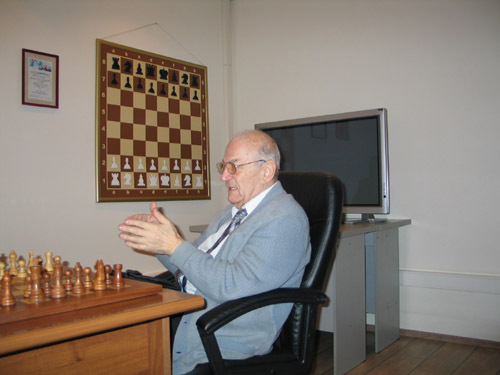 I offer the readers “Korchnoi: the watch”, in which the famous grandmaster (the watchman) as usual gives no quarter neither to the others nor to himself. Viktor Lvovich! I’ve chosen the subject “Genii and wunderkinds” for today’s interview. Whom do you consider to be ingenious chessplayers? How, in your opinion a concept of “genius in chess” can be defined? First of all, I do not consider myself among this category. I’ve started looking through my early games recently and I did not think highly of them. In general I assume that it’s sufficient to get hand in chess in order to achieve success, while talent and especially genius is not of necessity at all. It’s not necessary, but it’s desirable. 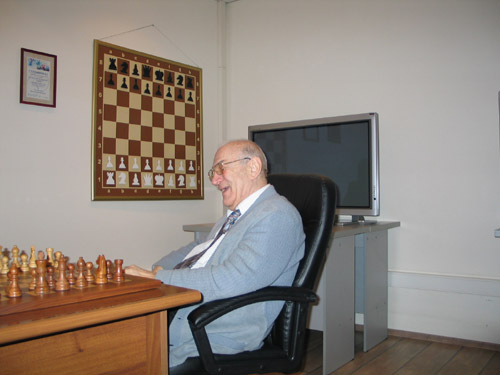 Admit that there are heaven-born chessplayers, who are fated to become great. I suppose that Capablanca was an ingenious chessplayer. To put it more precisely, his talent became apparent in childhood. While, in my opinion, neither Botwinnik, nor Alekhine and Lasker were genii. They were simply talented people, who toiled their way to the world top players by will-power and working ability. I think that there are a few genii. If to speak about modern chessplayers, Russian chessplayers, I consider Morozevich to be very talented, I feel that his talent became apparent in childhood, but I did not see him working hard. As for the chessplayers of the West, I liked Anand very much I played against him several times and I saw his improvement. Genius is a very strong word! Nevertheless, he was close to this definition. Magnus Karlsen made good, even strong impression on me. It seemed to me that the main thing was not a chess aspect, but his extraordinary strong psychology and he uses psychological aspect of his mental power (something of that kind) over the board. I saw him playing a game against Shirov in the tournament where he did not shine out, and during the game it seemed that he should have struggle for a draw, he had a worse position, but he suddenly played an incredible combination. I thought that Shirov was really more psychologically vulnerable than other strongest grandmasters, the same thing felt Karlsen and he decided to risk: instead of playing for equalization, he posed such a problem for Shirov, which he did not manage to solve. However, speaking objectively, Shirov could have managed and could have won the game. However Karlsen decided that he could venture out with Shirov! Now he has one success after another, he takes great strides forward, and it seems even strange to me because he did not “glow” that much last year, I played with him in a tournament in Norway – nothing special. And now he beat down one after another in Khanty Mansyisk – well done! 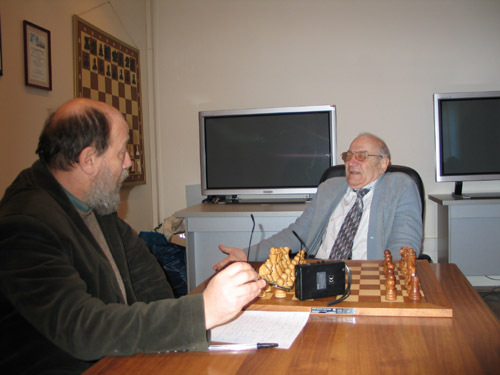 I’ll repeat that we speak not only about a chess genius, but about human mental power, not only a chess one. I’m not a psychologist, so it’s difficult for me to find an appropriate term. YoungKarlsenisamongsuchpeople. If Karlsen keeps developing with the same speed, how do you think, when will he become number one? 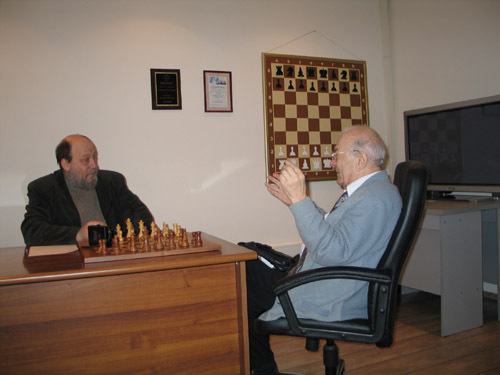 In view of your question, I’d like to remember Mikhail Tal’s creative development. He really had a bright talent, he did not make an impression of a hard worker, but of a man with ingenious ideas. 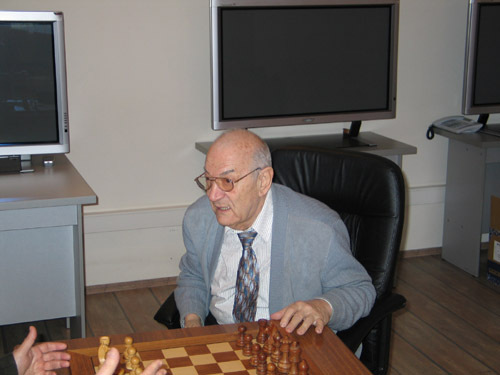 He had a strong psychology and he managed to defeat almost all modern grandmasters with rare and obscure exception – he lost to Keres and to me, and to no one else. Perhaps, even very likely that Karlsen will come across very strong people, who will not fall under non-chess influence. What about Karjakin and his future? I will pass this in silence. I do not think that highly about Karjakin’s talent. Similarly I can not understand how Kamsky lost one tournament and thus showed that he is not very talented, and afterwards suddenly decided to play a world championship match against Karpov. I was a spectator of Karjakin playing in the same way. Does it follow, that there is no one but Karlsen to count on? I’ve recently written an article for «New in chess» about Nakamura, Harikrishna and Karlsen. I was disputing a question why Nakamura made the second move with the queen on h5. It’s clear that if it’s played just once, the opponent’s head is in a whirl and he does not know how to respond. However, when he plays this the tenth time, his opponent, whoever he is, is ready for this move and one can’t expect it to come as a surprise. While it’s absolutely evident, that this move according to strict chess rules is wrong. Nevertheless, Nakamura continued playing this way and losing. I even assumed that this move reminds some images of Japanese mythology. When I told this I was objected and I was told that Nakamura is not a Japanese, but an American. Well, he is from Japanese Diaspora and looks like a Japanese. However, the main thing is that he has never explained, even after an accidental win after Фh5, what for does he make this move. This is the reason why it seems to me that there is a relation to Japanese mythology. May be Zvjaginsev’s move Ка3, which he used at the Russian Super final, is also connected with Japanese mythology? No, he is a rarely original chessplayer. We started speaking about genius and talent in chess. While Zvjaginsev has an unusual view on life, which is reflected in chess..
What is the aptitude for chess? Which set of abilities is necessary in your opinion? I’m not sure that I had such..
What could you achieve if you had such? I was thinking about this when I was watching Karjakin playing – he also improves year by year, but he does not aptitude for chess. Although he can reach a level, which I jumped over or tried to do this. And purely chess abilities – when one can see different things immediately. Perhaps, this is a quick assessment. Tal was especially good at this, he was quick in the uptake of details, not only of general plan. Inchesspositionsitwasalsopeculiartohim. Hewasingenious. I he hadn’t become a chessplayer, he would have been a literary or musical or any other genius. But there are people, who can not surprise the world with anything, but chess achievements. They became a skilled hand at chess and finally achieved a success. I will risk giving Botvinnik and Spassky as an example, however Spassky possesses some talent. And if a person deals only with chess and wants to achieve a success in this field, it means that he is not talented and such a one-sided man can not be a chess genius. In this regard “Chess Novel” by Stefan Zweig is of interest. He predicted in it that there are chessplayers of two types: some will climb the heights due to huge chess intelligence, while the others will do this due to its absence. He was sailing from Europe to America and on board of the ship got acquainted with grandmaster Kostic, who made a painful impression on Zweig. Summing up, it’s possible to say that there are genii, who approve themselves in different fields, they can be good at chess, but this is a mere detail. Specialchesstalentdoesnotexist..
Did you meet people, who gave up chess because of their keenness on other things and became famous in that kind of activity, though they could become outstanding players? Kamsky is the only person I can mention, I do not consider him to be a very talented chessplayer though. His father wanted him to make more money and he started studying surgery. Afterwardsfatherwantedhimtobecomealawyer. I mean the case when a person along with chess does well in other activities; mathematics, physics, literature… then he gives up chess at the right time and becomes famous in the field he has chosen. Ithinkit’spossible. Chessislikeacontagion, it’sdifficulttorecover. Otherwise it’s possible to imagine that a generally talented person, who is able to achieve a success in chess, will certainly be able to succeed in other activities. In regard to contagion. Do you think that children should be taught chess in the modern world? If you think that they should be taught, at what age it’s better to start? From personal experience I feel thatfirst children should get a general education. I was a talented child, I used to read a lot… As soon as I started studying chess seriously I gave up reading and I haven’t read books for adults, Dostoyevsky, for example: I had neither time nor strength for this. For this reason education should be provided first, and then one can be taught chess. 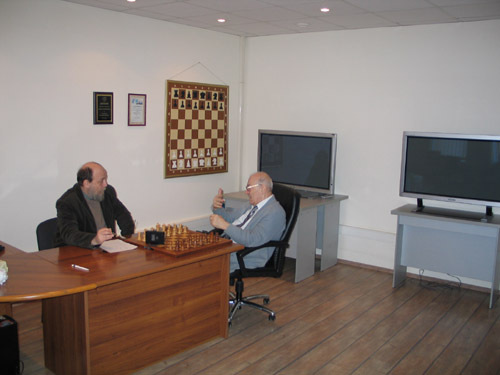 It’s quite another matter, that chess lessons instill assiduity, develop mental abilities for comprehending other knowledge, it means that chess is useful. There are not many proofs, though. I want to ask a question concerning Petersburg chess. How can be explained a fact that in our city, which gave a lot of outstanding players to the chess world, there have been no world level chess players after Svidler, who was born in 1976, the year when you and Spassky left the USSR? It seems to me that it’s better to develop chess in a small city as there are less interest and temptations. There are many interesting things apart from chess. Karpov came from a small city, Kasparov (by the way I did not mention him when speaking about genii) came from not a very small, but not from the largest city..
A question about Svidler. Do you think that he will be able to reach a greater success than in San Luis? I think that he has prospects. He might have psychological problems, but his organism will solve these problems with the increase of years and he will be able to achieve a greater success. A question concerning Topalov. What about his prospects in the near term? Read, what the participants were writing about the San Luis tournament winner. I do not want to speak about Topalov for this reason. Which places in St.Petersburg are especially dear for you? TheSommergarden. I used to walk there with my parents when I was a kid. And what about chess places? What about your preferences in music? I’ve not developed them. I mean, I’m fond of listening to pleasant music, I absolutely don’t like pop-music. I can not understand how young people can listen to this crash. I do not understand anything in this field. You are invited for today’s Taimanov’s jubilee celebration. This gives occasion to come to the wunderkinds issue. Mark Evgenievich showed aptitude for music in his early youth, he acted in a film the “Bethoven Concert”. He is clearheaded and looks fine, though he is eighty. You will be 75 in March. You play at a high level in serious tournaments. At the same time in literature the image of a chessplayer is geared to strangeness and enormous mental and nervous work. Do you have a secret of being in good form? As for me, I have been developing as a chessplayer for a long time, perhaps, this fact prolongs my career. While Mark Evgenievich has always taken chess easily and had played the same variations for tens of years..
Could you tell a few words about the World championship prospects? I think that the match Topalov –Kramnik will not take place – they will hardly agree upon their titles. Is there any chance of Kasparov’s returning to chess? There are not too many people, who are interested in chess, and a million people at most were applauding to Kasparov. While it’s possible to have much more people clapping in politics. That’swhyhesettledforpolitics. Asforhisreturning– timewillshow!